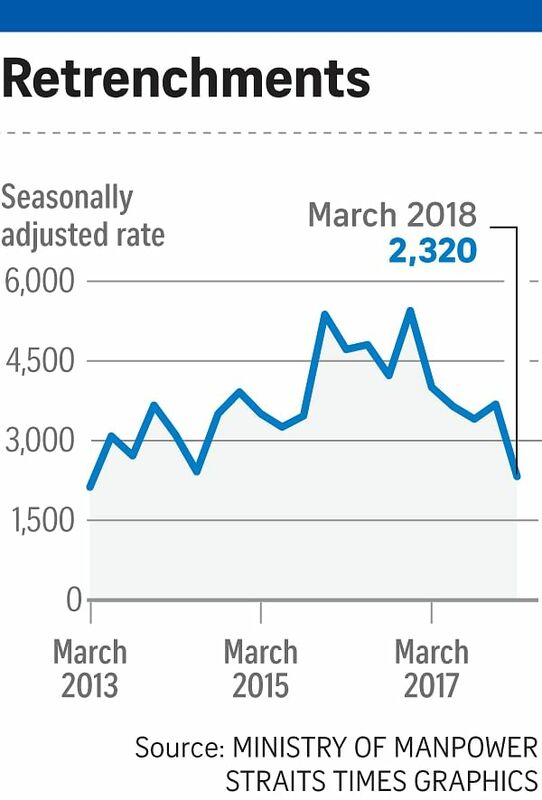 The Singapore labour market continues to improve, with fewer people getting retrenched and more vacancies for job seekers in the first three months of this year. Layoffs plunged to a five-year low, with 2,320 workers asked to go compared with 4,000 in the same quarter last year, said the Ministry of Manpower's (MOM) labour market report released yesterday. Economists interviewed see the figure declining further this year. CIMB Private Bank economist Song Seng Wun said: "The worst seems to be behind for some vul-nerable sectors like oil and gas." Oil prices have been recovering since the start of this year. Another improvement is that for the first time in two years, there were more job vacancies than jobless people, the MOM figures show. The seasonally adjusted ratio rose to 1.04 in March. The brighter job market is due to the Singapore economy growing faster last year when it expanded 3.6 per cent, more than double the initial forecast. "This has led companies to push through with expansion plans," noted Mr Paul Endacott, regional managing director for Asia of recruitment firm Ambition Group. With these improvements, the seasonally adjusted unemployment rate dipped in March to 2 per cent, against 2.2 per cent a year earlier. But for Singaporeans, it was 3 per cent. It slips to 2.8 per cent when permanent residents are included. The corresponding rates a year earlier were 3.5 per cent and 3.2 per cent. Typically, the rate for Singaporeans is a tad higher as foreigners may leave the country when they are out of a job, noted Mr Joshua Yim, chief executive officer of recruitment agency Achieve Group. The two groups of job seekers that continue to struggle are those aged 50 and older as well as PMETs (professionals, managers, executives and technicians). In a Facebook post yesterday, labour MP Patrick Tay said that efforts to support older workers and PMETs - who make up the largest groups of those retrenched - need to be maintained. The labour report shows 53,900 vacancies in March, and more than half were for PMETs. A year ago, the vacancies totalled 46,900, after seasonal adjustments. Overall, the increase in total employment, excluding foreign maids, in the first three months against the previous quarter, was slight - at just 400. The report says it was led by the service sector, such as community, social and personal services. This helped to offset the decline in employment in manufacturing, which shrank by 3,800, and construction, by 5,600. This could be due to a slump in the marine and offshore sector, said Mr Song. But the ministry expects overall labour demand to expand this year, although it will be uneven across sectors. It forecast promising opportunities in the service sector, including healthcare, logistics and wholesale trade, while construction and marine shipyards are expected to remain cautious in hiring. Mr Endacott said demand is likely to be strong for people with digital skills in such fields as data science and software engineering. Economist Chua Hak Bin of Maybank Kim Eng, however, is circumspect, saying the tight foreign manpower policy could hinder further job growth. "You need new investments for new jobs, but they may not be rushing in due to the difficulty of hiring." Mr Tay added that pockets of layoffs, resulting from restructuring forced by technological disruptions, are still to be expected in the first half of this year.